ATLANTA, GA--(Marketwired - Oct 6, 2015) - Schlotzsky's®, home of The Original® oven-baked sandwich and famous Fresh-from-Scratch® buns, will celebrate its 44th birthday on October 6 by rolling back prices nationwide on a small The Original sandwich to just $1.99. The one-of-a-kind sandwich that started it all features 13 fresh, flavorful ingredients, including fresh-from-scratch sourdough buns baked in restaurants daily. "We love any opportunity to spotlight the sandwich that made us famous, and celebrating our 44th birthday is just another great reason," said Schlotzsky's President Kelly Roddy. "We can't wait to share with our loyal guests the Lotz More we have in store for our milestone 45th year." October is also a great month to try one of four delicious Pretzel Dippers, Schlotzsky's limited-time only hot sandwiches that feature fresh meats, cheeses and other ingredients atop Auntie Anne's® pretzel buns, served alongside signature dipping sauces. The Beef Chief - Shaved Angus roast beef topped with a trio of melted Muenster, Provolone and Swiss Cheeses and rich, caramelized onions -- served oven-baked on a Soft Pretzel Roll with French Onion au jus dipping sauce. The Hogfather - Sweet Italian Sausage, Piquant Pepperoni, Cotto and Genoa Salami topped with melted Muenster, Swiss and Provolone cheeses -- served oven-baked on a Soft Pretzel Roll with Bold Marinara dipping sauce. The Big Cheese - Four Cheeses -- melted Muenster, Parmesan, Provolone and Swiss -- layered with crisp, smoked bacon strips and vine-ripe tomatoes -- served oven-baked on a Soft Pretzel Roll with Tomato-Basil dipping sauce. The Ham Dunk - Shaved Black Forest Ham topped with melted Muenster, Provolone and Swiss cheeses -- served oven-baked on a Soft Pretzel Roll with Brewhaus Cheese dipping sauce. 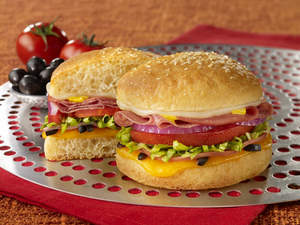 For more information or to find the nearest Schlotzsky's location, visit www.Schlotzskys.com. Since 1971, Schlotzsky's® has been the home of The Original® oven-baked sandwich. The menu has evolved with guests' tastes to include the highest quality hot delicious sandwiches on its legendary Fresh-from-Scratch® oven-baked sourdough buns, gourmet pizzas, Artisan flatbreads, oven-baked pastas, freshly made-to-order salads, savory soups and delicious Cinnabon® treats at co-branded locations. With more than 350 locations in 35 states, Schlotzsky's is the fast-casual choice for a quick and fresh dining experience. For more information, visit www.schlotzskys.com. Atlanta-based FOCUS Brands Inc. is the franchisor and operator of over 4,000 ice cream shoppes, bakeries, restaurants and cafes in the United States, the District of Columbia, Puerto Rico and 60 foreign countries under the brand names Carvel®, Cinnabon®, Schlotzsky's®, Moe's Southwest Grill®, Auntie Anne's® and McAlister's Deli®, as well as Seattle's Best Coffee® on certain military bases and in certain international markets. Please visit www.focusbrands.com to learn more. About this company Schlotzsky's, Inc. The Original(R) oven-baked sandwich made with lean smoked ham, Genoa and cotto salamis, and melted cheddar, mozzarella, and Parmesan cheeses layered with black olives, red onion, lettuce, tomato, mustard and our signature dressing on our toasted Sourdough bun.